The Cybex VR1 Duals fly and rear delt features a multi-function mechanism to provide two types of exercises in one machine thereby ensuring space and cost efficiency. 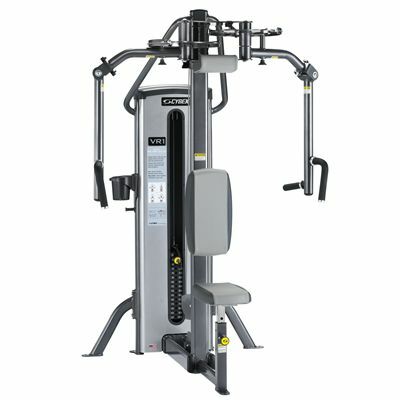 The machine uses independent movement to allow training each arm according to its needs and balance the workout when one arm is weaker or injured. This type of motion encourages symmetrical strength development and also allows for bilateral reciprocal training. The station also offers automatically adjusting floating input arms with horizontal as well as vertical handles. The handles are positioned so that the seat does not have to be adjusted going from one grip to another for additional exercise comfort. for submitting product information about Cybex VR1 Duals Fly and Rear Delt We aim to answer all questions within 2-3 days. for submitting product information about Cybex VR1 Duals Fly and Rear Delt. We aim to answer all questions within 2-3 days. If you provided your name and email address, we will email you as soon as the answer is published. for submitting product review about Cybex VR1 Duals Fly and Rear Delt.